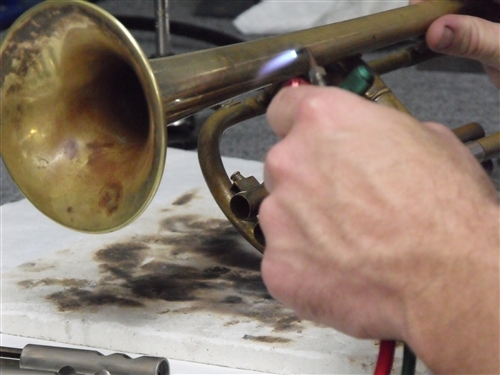 Brass Instrument Repair at Accent Music. Accent Music has been the leader in Brasswind repairs for the region for over 23 years. We have a full service shop on location. Full service dent and valve repair, flush and clean service, lacquering, refinish, etc... There is not much we can't do here. Submersion of horn body, slides and valves in cleaning solutions. Reassemble, relube and oil of valves and slides. Replace new corks, felts and springs as needed. Valves/rotors are cleaned and aligned. Levers are restrung. Mouthpiece is cleaned and sanitized. Marc Gullo, our lead brass and woodwind repair technician graduated from Red Wing Repair institute and has been working with Accent Music for over 20 years. He is a member of NAPBIRT (National Association of Band Instrument Repair). His reputation for quality and timely repair is renowned amongst Band Directors, professional players and students. All of our work is guaranteed.Loaner instruments are also available to use while yours is in for repair.